The Jackson Hole meeting is now upon us, a gathering of the worlds central bankers who will put their collective brain power to work in an attempt to resolve the economic woes that most sovereign states are now struggling to remedy. As investors in gold and silver these meetings are important to us as they may provide us with clues as to what policy changes are are about to be unleashed upon us as they attempt to steer the world away from a global depression. The Federal Reserve is also charged with keeping unemployment low and so it needs to implement strategies that will hopefully boost the American economy. We have experienced those actions through the process of quantitative easing. Now there are those investors who are interested in the precious metals sector who are of the opinion that without further monetary policy easing, which is a form of currency debasement, gold prices will tumble. We agree that the implementation of QE3 would drive gold prices much higher, however, we disagree that this is the one and only factor that will determine the future price of gold. 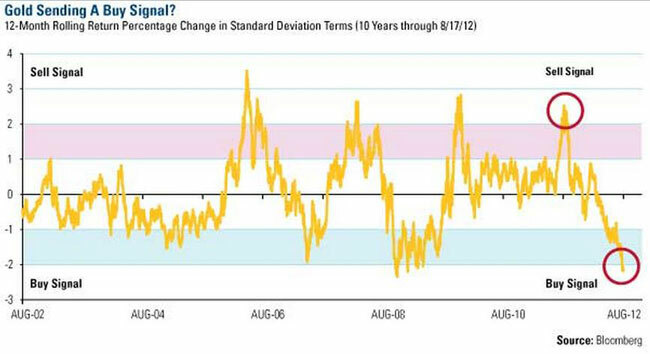 The chart depicts the 12 month rolling return percentage change in standard deviation terms, suggests that now is a good time to invest gold. We are also of the opinion that gold has been in a consolidation period for over a year, building a good base from which it can spring board to higher levels. Some of the central banks are now purchasers of gold whereas in the past they were sellers of the so called barbarous relic. The sentiment towards gold is negative, just ask any of your friends or colleagues what percentage of gold makes up their portfolio and generally they will answer zero percent. True this is only anecdotal evidence but we get the impression that the general public are oblivious to gold. Their participation in this bull market will probably not be felt until gold establishes a new all time high, but once they do take an active interest gold prices will well and truly rocket. Back to politics. The Federal Reserve is not only player when it comes to monetary easing, the month of September is going to be a huge month for the Europeans. Mario Draghi, President of the European Central Bank has stated that he will do everything in his power to keep prices stable in the eurozone. This will require further bond purchases by the ECB in order to suppress rates to a level that the troubled member states can afford to pay. Germany has of course reservations about such policies, but they to have a lot to gain by keeping the eurozone intact, as it is a large market for Germany's exports. Then we have the Chinese, who have recently announced that a total of 8 trillion yuan will be spent in order to boost their own economy. We can only conclude that although all eyes are focused on the Federal Reserve there are other factors in play that will drive gold prices higher and we are quietly confident that a new all time high of around $2000.00/oz will be achieved by New Years Eve. That is a move of some $350.00/oz, or 20% in a time period of four months. Ambitious you say; not for the quality performer that is gold.